DeSano Pizza follows the strict guidelines of the Associazione Verace Pizza Napoletana (VPN), preserving the centuries old craft of making authentic Neapolitan pizza. 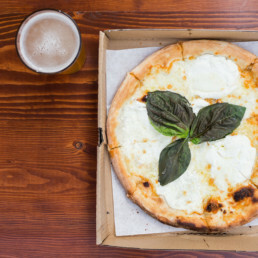 From the imported Italian ingredients and hand-kneaded dough, to DeSano’s world-famous Acunto ovens and highly-skilled Pizzaiolas, pizza lovers can experience what true Neapolitan pizza tastes like! All of DeSano’s delicious pizzas are expertly crafted to order and cooked in a wood-burning oven for a quick 90 seconds, slightly charring the crust without compromising the fresh toppings.